Lately I've been revamping my pull list faster than Mystique having an identity crisis. This month I want to shine the Panel Beater light on four titles putting the 'happy' back in comics. I can't believe how popular this comic is with my non-comic friends. I guess there's just something about a woman trapped in a girl's body, trapped in a fairytale world, getting high and solving her munchies by eating the army of mushroom soldiers attacking her that everyone can laugh at. Sure, that's a previous issue, but the foul-mouthed, hard drinking, mega-violent Gert continues her search for the key back to earth in this issue, with the same level of carnage as the issues before this. I Hate Fairyland, with its black humour, sage sidekicks and blood-stained fairytale scenery has become my first read every month. 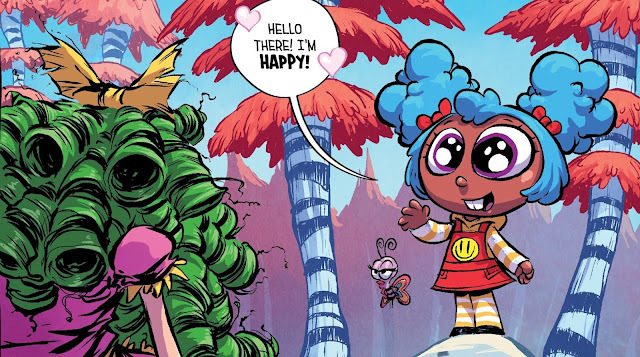 I love it and can easily picture writer and artist, Skottie Young cracking up over every pencil stroke. Here, Gert meets the yin to her yang. Happy, another trapped earth girl who has set out to find the key home, and have an amazing time doing it. One of them will walk away, the other will find it's not just gold buried at the end of a rainbow. Click over to the next page for my thoughts on Swamp Thing #1, Spawn #258, and Invincible Iron Man #5. Unlike Clayton Crain, I've never seen Kelley Jones as a "dark artist". I see him as a fun artist who wields ink in a stylised way. He finds something about a character that defines them and showcases it in a way other artists dare not to. Batman's cape and Bane's bulk two examples springing to mind. Twisted tree branches, the patterns of nature and close ups of eyes that harken back to vintage horror movies, Kelley creates an atmosphere that gives the Louisiana swamp more character than any mere 'bat cave' and one where creator Len Wein's tale of classic horror can firmly take root. Taking time away from the parliament of trees to prune back the clutter of his life, Alec Holland's alter-ego soon finds himself entwined in a couple's plea to find their lab experiment son and what has become of him. While he may be subdivided about his future before the issue's end, with scenes as memorable as Swampy materialising before a zombie as a floating eye, this is one seasonal I hope turns perennial very soon. PANEL OF THE MONTH: SPAWN #258 The debut of Todd McFarlane inking the pencils of Erik Larsen, and while 99% of the issue is silent, that silence sure gives the last line more punch. Future issues have seen their two distinct styles gel a lot more, and while I'm still not a fan of 'Venom mouth Spawn', Spawn in fairly super-hero based stories like this works out just fine. 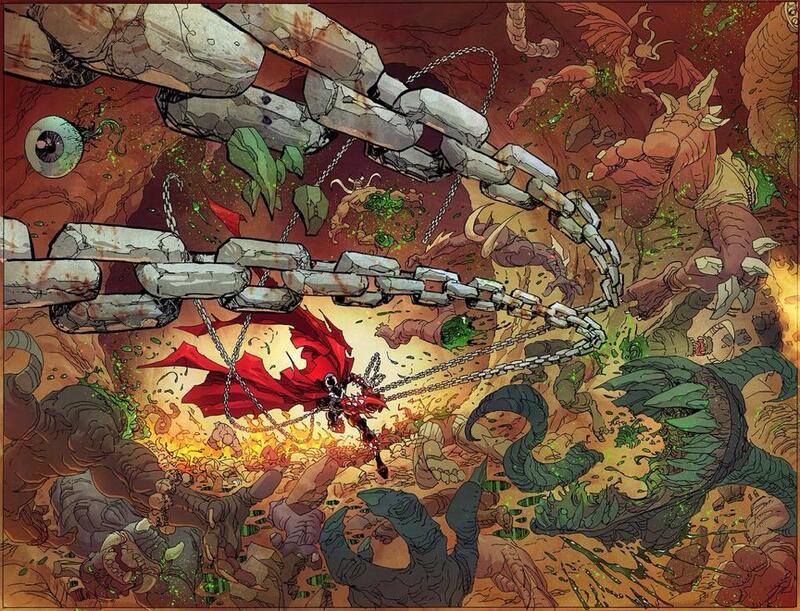 Plus we get a Larsen led Kirby / McFarlane-ish hell that would make anyone happy. INVINCIBLE IRON MAN #5 Sure, the issue where Iron Man and his sidekick Dr Doom confront the big bad may not seem a 'happy' issue, but it is just that because that "big bad" is Madame Masque. Whitney Frost's suicidal history with Tony Stark makes her the only foe for a debut Iron Man story-arc. Writer, Brian Michael Bendis knows and shows this, returning a classic chemistry to Iron Man I haven't felt since the pre-movie days. And that's a reason to be happy. Wait, you seriously don't consider Kelley Jones as a dark artist? Are you crazy man!? He's the very epitome of a dark artist. He's this century's Berni Wrightson, who's only rival(and oddly enough very similar in style to) Tom Mandrake. Yeah but I don't see Bernie as a dark artist either - sure they draw horror well, but that doesn't make them dark. Their work isn't anarchistic or evil or sombre or depressing at all. I think they are both talented artists who know how to wield ink that creates amzing visuals - sure the art uses a lot of black, but heavy inks don't make you a dark artist either. Huh...ok, well then I'm curious who you'd consider a dark artist then. Dark artists to me? Three off the top of my head would be Gabrielle Dell'Otto, Francesco Mattina, and Ben Templesmith. Hope those help convey what I'm trying to say.